Easter is the best time of year to be outdoors and spending time on the water with good mates. 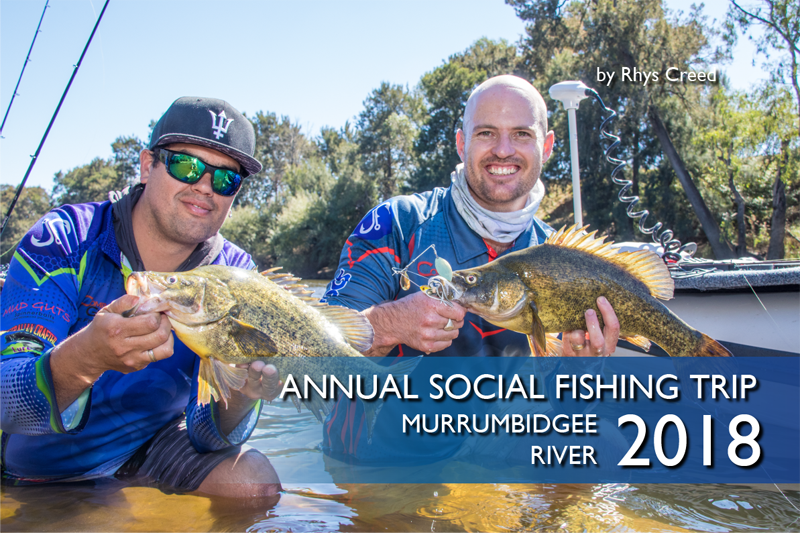 This year we were blessed with incredible weather as we spent the weekend floating down the Murrumbidgee River! Our trip was planned well in advance for four of us to float in the two Takacat Sport 300’s. Chris at the helm of his craft with Lachlan joining him and Mitch jumping in my boat. Late the night before Adam became our 5th man due to his Easter weekend trip being cancelled at the last minute. Arriving at our drop point at first light on the Friday we were all pumped for a great weekend. We filled my car with all the gear and headed up to our launch location. We were all setup and on the water by 9am. 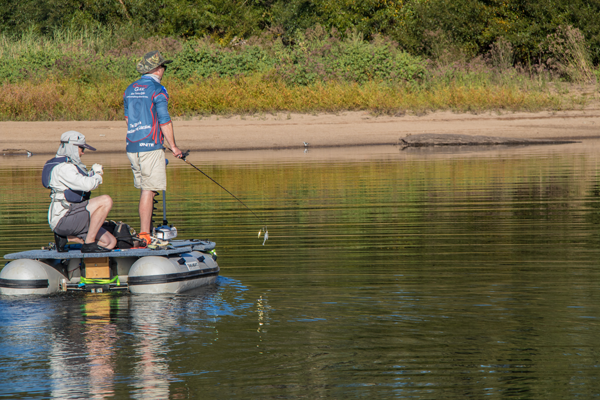 Nothing better than the first cast of a big fishing trip, what was ahead of us was unknown! Getting on the water slightly later than we wanted meant we missed the early morning bite. Casting away against the willow lined banks it took more than 45 minutes to find the first fish. We had all just worked a really good section of river for nothing and Mitch and I were casting at one of the last willows on the bank. It was barren and didn’t have much going for it until half way through Mitch’s retrieve he was drilled. With super clear water we were able to see this fish shooting off to the side as soon as it was hooked. It was a solid Golden Perch and Mitch was pumped to get the first fish of the trip. 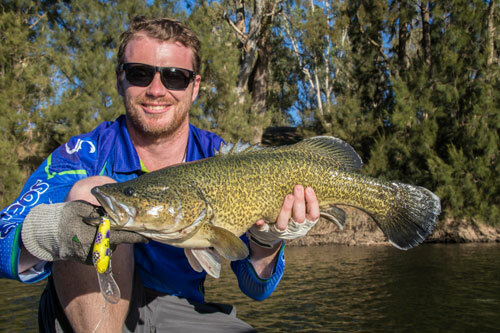 Over the next hour of so the action was all on Mitch’s lure. 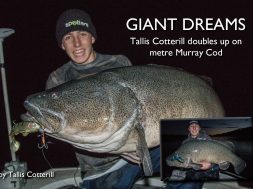 He had another three follows from Golden’s including one fish that had a crack at his lure as he flicked it off a snag. Was crazy to see him come back for a look another three times before disappearing. The first few hours were much slower than expected until we started working a shallow shaded bank at around 11am. I was casting away at a nice log sitting in no more than a metre of water. I could see my spinnerbait for three quarters of the retrieve and on the third cast I spotted a small Golden come racing out and have a crack at the lure. I struck and the hooks didn’t connect as the lure came flying out of the water towards Mitches head. “Did you see that?” I said to Mitch and he replied with, “I saw it and then I saw that thing flying at my head”. I continued to cast to the log not expecting this fish to come back before whack! And this time it stuck. I was on the board with a nice mid 40s sized Golden Perch. After releasing this fish we started working the next snag and I placed a cast tight in against the root ball. I allowed the lure to sink right under the log and on the drop it was hit hard! 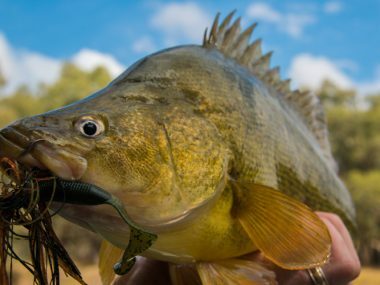 Always allow your lure to sink beneath the structure you are casting to, especially if the water is clear and there is little current. Natives will sit right beneath logs but they will also sit in deeper water towards the bottom of the river. 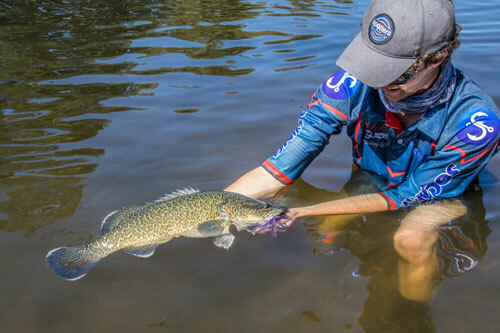 There is usually more structure down further and in clear water (especially in high light periods) fish will sit further down as they would feel more confident. I struck and this fish started pulling hard and straight away I knew it was a solid fish. A few more pumps and a quality Golden Perch broke the water’s surface. The fishing was picking up, this was a much better bite. Within the next half hour Adam managed to hook another good Golden Perch and while we were getting ready to take photos Chris hooked into his first fish of the trip. Out on the sandbar we managed to capture a great double hook up photo. The double hook up is great photo from the trip. The colours look amazing with the trees, water and fish. What we did with this photo is we had it ‘back lit’, this means the sun is behind the subjects (Adam, Chris and the fish) and it gives them a halo look. The issue with taking a normal photo like this is, the subjects would normally be extremely shaded and dark which makes the photo look terrible. What we did here was used an external flash (Yongnuo Flash) with a Light Dome (Garry Fong) to take away these shadows in the image. It’s a great way to take an amazing shot with incredible colours. Another quick tip I have for you is to take your images in RAW and then you can adjust the shadows, vibrancy, highlights and colours in post-production (using Lightroom or Photoshop). The next eventful part of the trip was not fish related but it still might go down as one of the most memorable part of the trip. Mitch and I were working the outside of a large fallen log while Chris and Lachlan were working up the back of it, between the log and the bank. Chris was slowly manoeuvring the boat in towards the root ball and Lachlan was facing the other direction casting out the back of the boat. Chris forgot to let Lachlan know there was a big branch and before he knew it he could feel this branch touching his back pushing him off the boat. 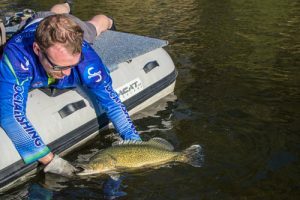 Next of all we came to a section of river that had a few large logs in which I had caught a big Golden Perch from on a previous trip. The log was totally submerged in the middle of the river and I was explaining to Mitch where it was as we moved within casting distance. I still couldn’t quite see it but I roughly knew where it was as I placed in my first cast. I started to begin my retrieve still not sure if I was near the log when only a few winds in I was smashed! If you prefer to read… I’ll keep going. I struck and missed… then whack again, again I missed… whack a third time and the fish still didn’t connect. 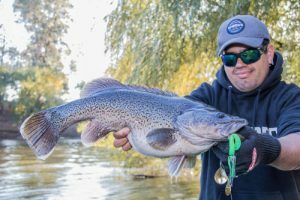 I couldn’t believe how aggressive this fish was! 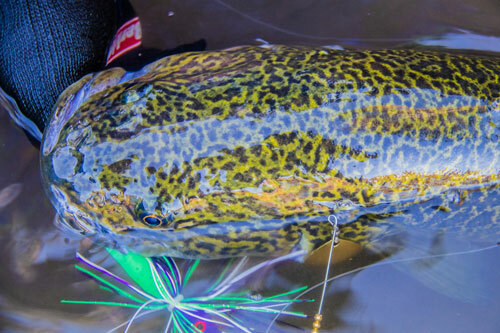 Tip: If you watch the video you will hear us talk about how this fish won’t come back. Now the reason for this; first of all it had a crack at my spinnerbait three times without hooking up. Now this is fine and chances are he would have come back on the very next cast, especially because it was such an aggressive hit. The fish never fell the weight of my rod and therefore shouldn’t have spooked. 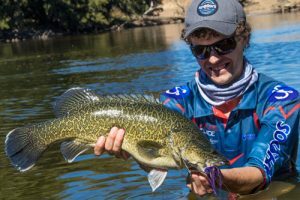 Mitch was mid-way through his retrieve and this same fish travelled two metres and grabbed Mitch’s spinnerbait at the boat. He was on and this fish was pulling hard! Mitch had him on for another 3-4 seconds and pulling string before it somehow fell off. We were all disappointed and right as it fell off we saw the white tips on this fish and instantly knew it was a cod! And a decent one at that! Now in 95% of cases this fish won’t come back. Because it felt the hooks and it felt the unnatural weight of Mitch striking and fighting. If a fish falls off after feeling weight this is normally enough to make them spook and not return for another attempt. This is the normal… BUT in this case this fish was one of those 5% that was on a mission for food! 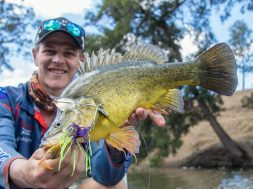 We continued to cast the area and I think it was my third cast back to the log but this time I had cast further and as it was making its way towards the submerged log… whack! 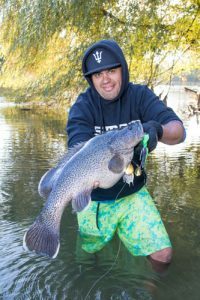 We couldn’t believe it but this fish came back for a third time and this time I made sure those hooks stuck! 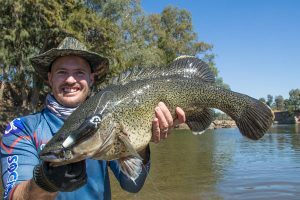 It was a beautiful 63cm Murray Cod, full of power and from beautiful clear water! At around 2pm we floated into a great section of river but unfortunately majority of the bank was soaking in high sun. It was a tough afternoon with only a few fish being landed between us. 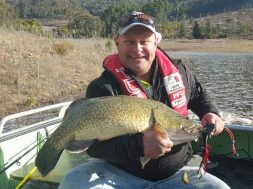 Chris was on the board landing a very nice 63cm cod and a 50cm Golden Perch in quick succession. This brought him right back up in the tally to be on par with me at 3 fish each. 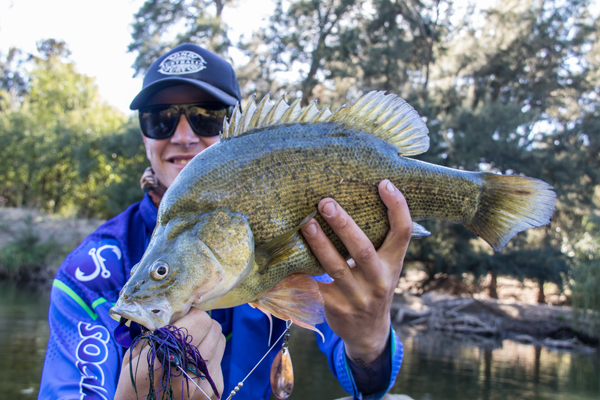 The sun was starting to fade and it was hitting about 4:30pm, still in direct sun and Mitch was rolling his spinnerbait around a big mid river boulder. As it passed across the front and made its way out of the shadow this cracker of a Golden appeared from the shadow following right behind the spinnerbait. It came right to the boat before having a crack, missing the hooks and turning for home. We started casting at the next log and I’ll try to paint a picture of this snag and explain how I approached it. It was a large tree that has fallen straight downstream with the current, so the root ball of the log was pointing directly up stream. First of all we cast spinnerbaits in tight against the log, allowing them to sink before slowly rolling them back out. Then what I did was changed to a hard body lure and as I did I told Mitch to run a cast right along the front of the root ball. He did this for no luck but then I followed with the hard body. 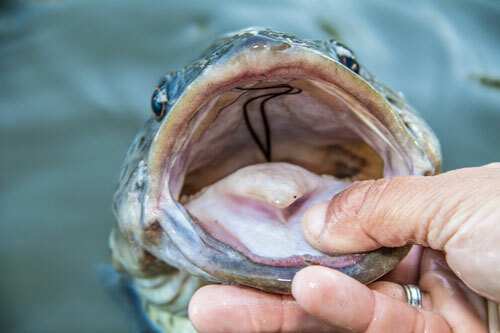 The reason I changed lure is because a hard body is perfect for situation like this because it can be cranked down and run across the face of the roots. The swimming action of the lure will enable it to stay down in the depths and tight in against the structure. I rolled it through the shadow and just as it popped into view and bounced over a root, this cracker of a Golden came from behind and smashed it! That’s what I call perfect timing as I was explain to Mitch exactly what I was doing and it worked! Finally the sun dipped and this is when the fish started chewing! 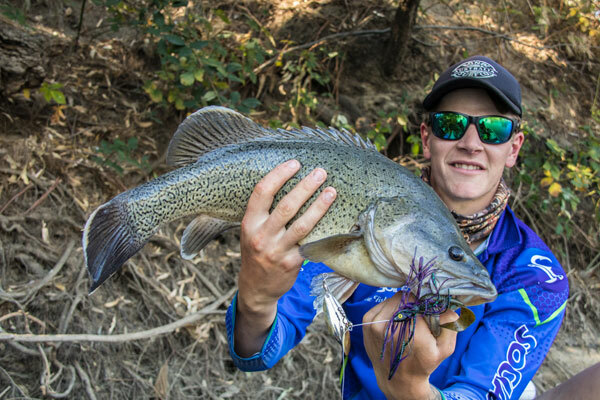 Lachlan had a tough day missing a few fish and finally while rolling his purple and chartreuse hard body over a mid-river log he had his first fish of the day. Mitch and I were working a great section of water and Adam lapped around us in the kayak and headed for a large log. I was telling Mitch how that log Adam was going to fish we had landed a metery from before. 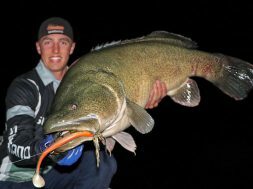 I thought Adam had hooked this metre cod until the powerful run stopped and Adam said he is good but not that big. 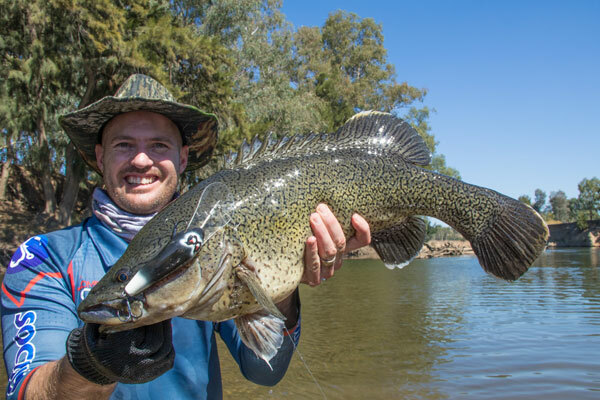 After a solid fight we managed to net a beautiful and solid 60cm plus Murray Cod. 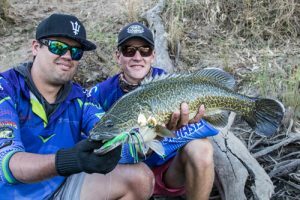 After taking photos and releasing this fish we started casting to the next log and whack Mitch was on as well to a similar sized fish! They were biting now and the guys were having a ball. The Light was Fading Fast! The sun was disappearing as we decided to tie on and start casting surface lures. We worked these for over an hour until light was well and truly gone before we pulled the pin and decided to get a move on. We still had nearly 2km of water to float through, that was full of rapids and… if I hadn’t already mentioned… it was dark! Under headlamp and torch light it took us 35mins to finally find the pull in spot where we unpacked, picked up the other car and moved on to our camp spot for the night. The camp spot was the start of our day two drift. 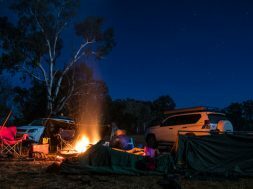 It took a lot of organising and resetting up that night to prep for the next morning. But once we were in our swags all we could think about was the morning… what would be in store for the day! Up with the cockatoos on first light and off went, floating down a much quicker and higher section of the river. This area was much more populated with Trout Cod so there was high chance of some hard pulling by-catches! We passed through the first rapid after 30 mins of casting without a fish and I was hoping they would switch on because so far it was a slow morning bite. We were working along on outside bend that was lined with timber and heaps of willow trees. When fishing for natives, don’t be afraid to cast at everything! You don’t always have to be fishing the biggest log on the stretch. You don’t know what’s beneath the surface and you don’t know where the big fish might be out feeding. Always cast to every likely looking piece of structure even small willow trees or spindly timber, you just never know. One thing I like to do when we are moving from spot to spot, is to put in whats called ‘speculator casts’. 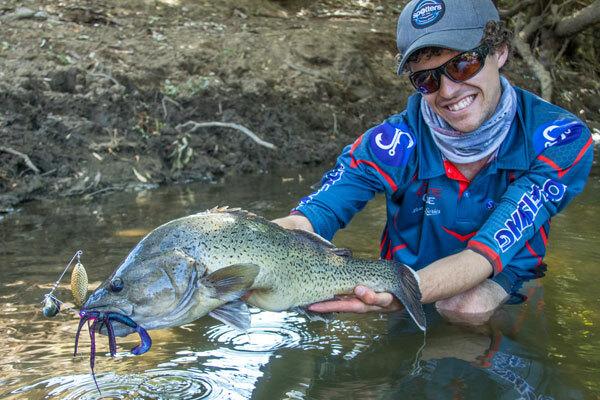 They are just random and quick casts at the edges of usually lame looking pieces of timber while you are skipping the area, because you just never know, one of those ‘speculators’ might land you a fish one day. But one rule about ‘speculator casts’ is don’t get snagged! While working this bank, Mitch and I were working along a boring section of willow trees while Chris, Lachlan and Adam were working a large fallen log. Adam was fishing in a kayak and in current so he had to pick and choose his locations to fish. On this particular log he positioned himself just sitting off the downstream branches and was casting back upstream into the root ball. Each cast he made he worked his way further and further along the long. Before one cast near the end of the tree he was smashed within the first few cranks. 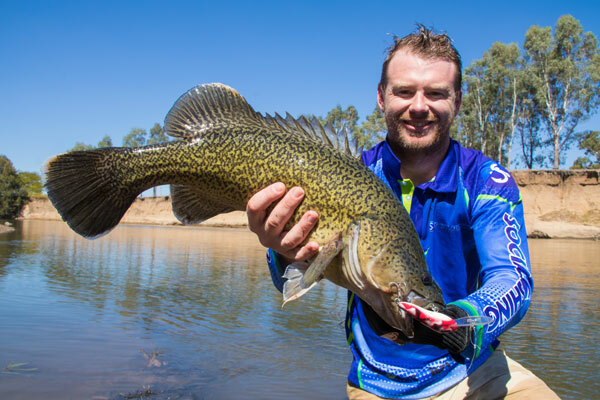 From 30m upstream we heard him yell out that he was on and the fish was pulling hard. It sounded like he had a good fish and Jack had caught a 71cm Murray Cod from this log two years ago so I was thinking he was onto a good fish. I powered down in the boat and when we arrived the fish had him bricked deep in the sticks. Adam said he was still there as he could feel him kicking but he wasn’t budging. 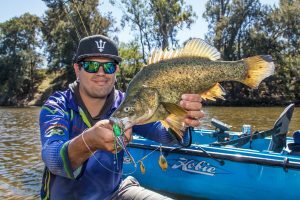 We managed to hold the inflatable above where the fish was snagged and Adam said it was a cracker of a fish because he powered about 8m upstream and even pulled the kayak. He couldn’t stop him and the fish got him into the sticks. It’s a common occurrence when fishing in rivers for natives to get tangled around structure. Don’t worry… this doesn’t mean the fish is lost! Most of the time they are only just caught around piece of timber and can easily be freed from the structure. First of all, you NEVER want to give the fish slack line! This is when the hooks will fall out from lack of tension so while ever your trying to free the fish, never let the line go slack. Most of the time the fish will just be sitting down against the log and occasionally you’ll feel them kick around, this is good (as long as the fish isn’t a monster, because chances are it’ll bust the line before you get a chance to free it from the structure). 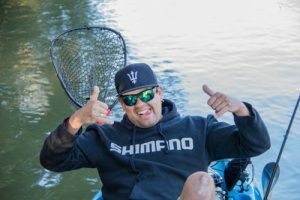 Once you’ve positioned yourself above the fish you’ll need to use your de-snagger pole to try and manoeuvrer the fish from the sticks. BUT the mistake many people make is to go in too hard and too fast! If you tap the fish on the head chances are it will spook and snap the line. What you want to do is slide the pole down slowly, once you feel your leader you know your only a rod length from the fish. Move the pole another 50cm down the leader and then try to push it in the direction you think the fish swam into the snag from. If this doesn’t work try all other directions, WITHOUT pushing the pole down any further and usually this is enough to free the fish. If it doesn’t come free after a few minutes of trying then slide the pole down further, very slowly and try to feel the timber that the fish is stuck around. From there you’ll want to again try to push the line out until the fish comes free. While you’re doing this I get the person holding the rod to have the reel in free spool but keep pressure on the spool by using their thumb. 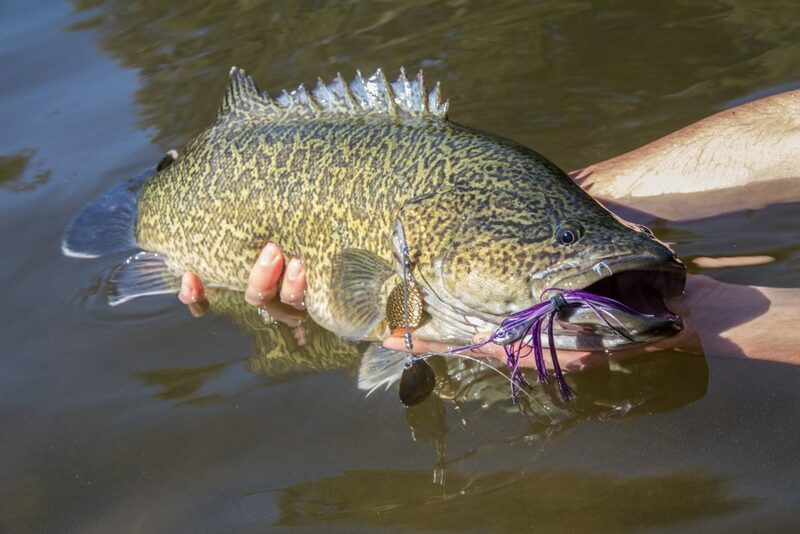 If the fish happens to kick around and go mental your mate holding the rod can give the fish line while just grazing their thumb on the spool to keep just enough tension. If you don’t disengage the reel, even with a light drag, they don’t always respond quick enough and the fish will bust off. So, I had the boat positioned right above the structure, Mitch held onto the rod and spent a good three minutes trying to free the fish. While Adam sat beside us in the kayak just hoping that we could get this fish out, he knew it was a solid fish. There was so much timber beneath us and I just couldn’t figure out where he was but with a head shake every 30 seconds we knew he was still there. I decided to go in deeper with the pole and luckily it was enough and the fish came free. 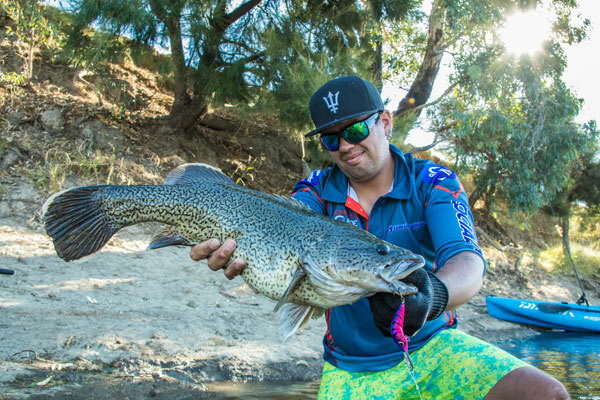 Up popped a cracker of a Trout Cod that was in the low 60cm but super FAT and fit! 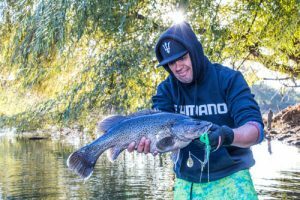 Once in the net we jumped out on the sand bar to take some photos and while Adam was removing the lure he noticed something incredible inside this Trout Cods mouth. 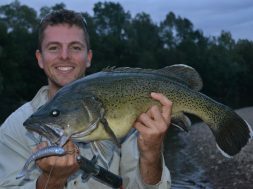 This fish had only just previously consumed a large Murray Cray and its feelers were sticking out the throat of the fish. We then felt along his budging belly and you could feel the spines from the crayfish. I always knew that cod ate Murray Crays but to see such a big cray inside this fish was unbelievable! 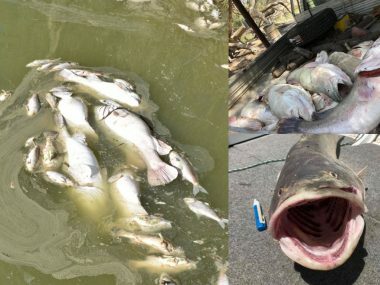 I must have hurt so much going down and must be so uncomfortable to digest – but goes to show that cod will eat anything! We continued to fish away with a few more fish caught on both hard bodies and spinnerbaits. 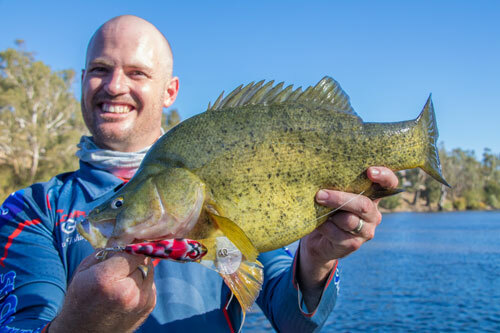 Mitch landed a very nice Golden perch sitting in a slow backwater on a large log. 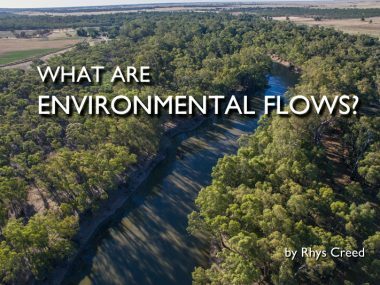 These slower flowing areas are more likely to hold the schooling Golden Perch. It was late morning now and I only had a tiny Trout Cod on the board. I was still casting away with the trusty Mud Guts 5/8oz spinnerbait and due to the clear water, we were targeting fully submerged mid river snags. These are the areas that you normally wouldn’t even see in murky cod waterways. We were lucky enough to be floating a clear section of river which allowed us to spot these logs. The only issue with fishing these logs is it’s very hard to get your offering down into the strike zone when the log is a metre beneath the surface and you are also battling current. 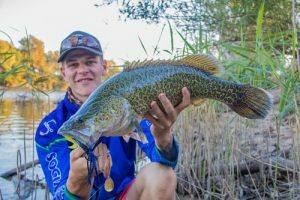 So my plan of attack on the day was to judge the depth and the speed of the current and cast the lure anywhere between 1-4m upstream of the log. I would also leave about a rod length of slack line in the cast and this allows the spinnerbait to cut through the current and sink much quicker than if it was to sink under tight line. Now… I do want to mention that I rarely ever recommend allowing the lure to sink with slack line as majority of the time you’ll miss the hit and the fish. But on this occasion my lures weren’t getting anywhere near the structure, so the only way down was to let the lures sink with slack line. Once they were just under the log, I’d pick up the slack line and give it a twitch to get the blades moving and also to make sure the lure hadn’t been eaten. If I’d feel weight on the flick then I’d instantly set the hook. I fished with this technique all day and Mitch spotted a big log that we were floating over. I decided to drop a cast right beside the boat and allowed it to sink under the log. I twitched and it didn’t feel right so… whack, I gave the lure a hit! As soon as I did this I felt powerful lunges and tail beats. I knew I was onto a good fish! This fish stayed deep and as it was in quick water I was expecting a decent Trout Cod. A few more pumps and the fish surfaced with my guess being spot on! Fishing away we continued to fish close to the shadows with a few more small fish hitting the net. Over some more rapids and we came to a fast outside clay bend. Adam went through the section first and Mitch and I second. As we hit the section I said to Mitch the best technique to cover this bank properly is to troll down with the current. Normally when targeting natives you troll upstream because you move far too fast going downstream. In this case, we were only passing through and we just motored through slightly quicker than the current to get our lures working along the bottom. And the way Chris yelled back meant it was a big fish. We were close enough to see the fish and it popped up between our boats. Wow… it was a beast of a Trout Cod but that wasn’t the scary part. It was only just pinned with the back hook on the outside of the gill plate. By the looks of it the front treble was in the side of the mouth but pulled out during the first half of the fight. 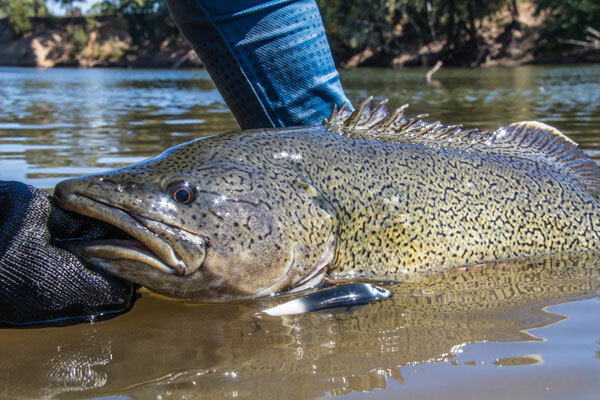 After seeing this I thought we had a very slim chance of landing the fish, especially as we were battling current and also mid river snags which were below us. Chris immediately put the reel into free spool and held his thumb on the spool. 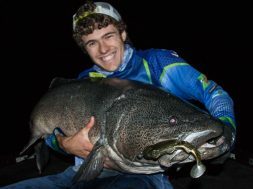 If the fish happened to kick, he could let it swim under very little pressure and therefore hopefully not pulling the hooks. 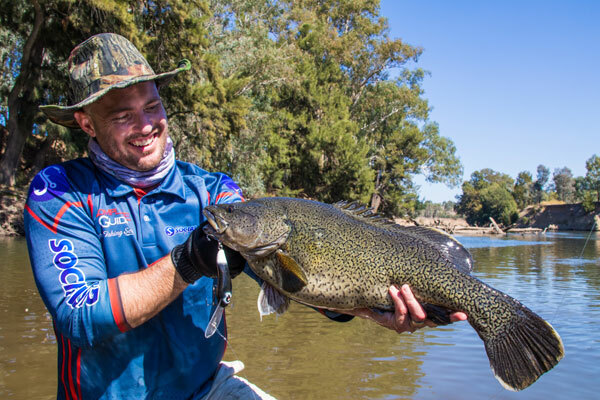 Lachlan was doing a great job to try and control the boat but it was heading for danger… large mid river snags! I motored over and after some tense moments Chris jumped into our boat and we steered him away from danger. We managed to bring the fish to the surface in some slack water and slip it into the safety of the net! 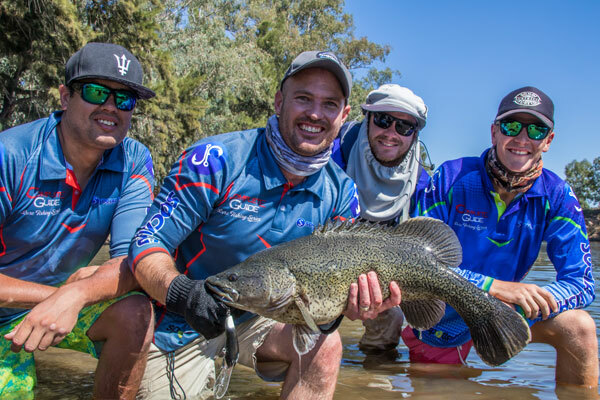 What a tense few moments it was but so exciting to land this beat of a fish that was by far the biggest of the trip measuring in at 68cm and full of power. 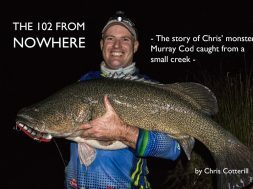 It was a great achievement that took a lot of angling skill on Chris’ behalf considering the situation. Floating around to the next bend we spotted a lamb that was stuck on almost a vertical bank. It was going to die of starvation if it stayed there so we decided to attempt a resue mission. It took a solid 20 minutes with Chris heading up the top of the bank and Mitch and I walking along the bottom with Adam in his yak. After a long time of trying to scare it down it finally fell and landed in the water. We managed to catch it and Mitch put it onto the side of the inflatable as we motored it to safety. 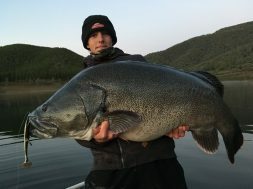 That was the 100lber for the trip! Good job Mitch. While the sheep rescue was going on Lachlan was downstream by himself casting to a willow tree. He was casting the 80mm Strike Force Cod Stalker and downstream of the shadow in the willow he noticed a fish come right to the surface under the willow leaf and slurp something from beneath them… and this was in full sun! The fish disappeared and Lachlan was positive it was a cod and he put a cast in where the fish was just spotted. He twitched it on the surface once before this fish bolted back to the surface and smashed the hard body off the top! We didn’t know any of this had happened until we went down to take photos of his fish and we couldn’t believe the story he was telling us. Would have been incredible to see. As the sun started to fade the fishing picked up… while we were fishing in the shade. The logs that were soaked in sun were dead. It just goes to show how important it is to fish banks lined this shade, you’ll always have more chance of catching a fish. Mitch had never caught a Trout Cod before so he was hoping one of the next fish was going to be the elusive TC. During the afternoon he was belted twice by what looked to be solid Trout Cod and both times they managed to slip the hooks. 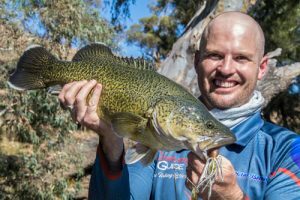 It wasn’t until late in the day while casting tight to a root ball that Mitch was drilled by a good fish which snagged him up instantly. We drove straight into the structure and the fish came free as soon as Mitch angled it in the opposite direction. It was his first Trout Cod and a big one at that! Mitch was wrapped and our day couldn’t really get much better. Mitch with his first Trout Cod! We were only a kilometre from our pull in spot and we were having the occasional cast to a few spots. The afternoon light was fading and we were on our way to the end of our drift. We spotted another nice clay ledge that didn’t look as deep as the one from earlier in the day but was definitely worth a crack. While Mitch and I cast to mid river snags Adam trolled along the clay edge. He only went for about 30m before his rod loaded right up and he was on to what looked like a good fish. 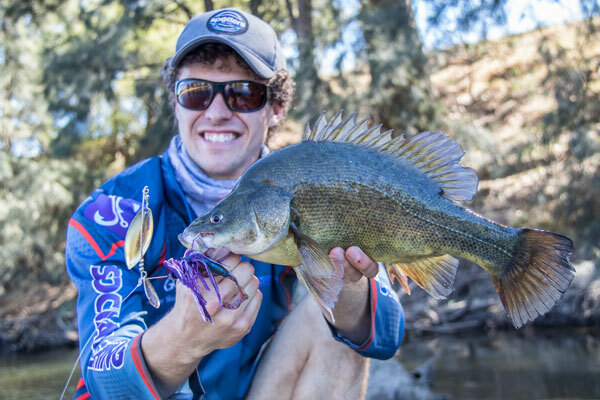 Once again… this fish managed to wrap Adam around a snag but in very fast water. Adam was a long way downstream, so Mitch and I boated over to see where the fish was caught. With the high vantage point on the inflatable we could see it was stuck underneath a big root ball. It took a lot of boating in the quick water before I was able to lay on the boat deck and grab onto the log with my left hand. From there I was able to reach down and flick Adam’s line from the log and therefore freeing the fish. It was another beautiful Trout Cod that made Adam’s day. We took some incredible pictures of this fish standing on the clay edge with the sun setting behind us! 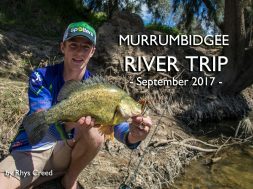 Last of all Mitch landed a bright coloured Golden Perch which topped off his trip and rounded us up at 30 fish for the trip. What an amazing way to end such a great two day Easter trip! 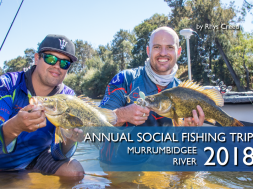 What a great Annual SF Drift along the Murrumbidgee River it was! We not only caught some great fish but had an amazing time with good mates! Hopefully you enjoy the long but exciting recount of our Easter weekend session. I included a range of helpful tips for fishing in any native river. Remember these and hopefully they will help you on your next session. 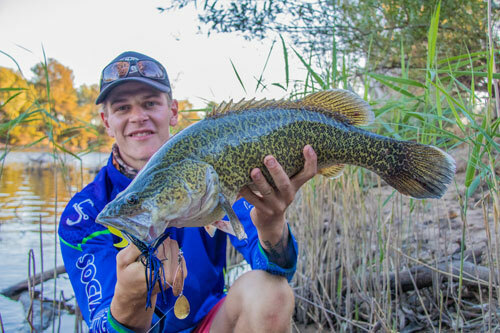 Last of all if you would like more information on freshwater lure fishing techniques make sure you have a look at the Complete Guide Tutorial Series here.